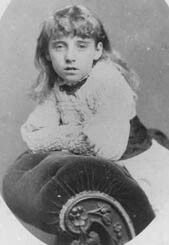 (younger) Eva 1876 - ???? Outline her Life: I knew Lilian when she was an old and rather forbidding old lady living on her own in the Red Cottage in Northwood, but by all accounts she was full of vitality in her younger days. 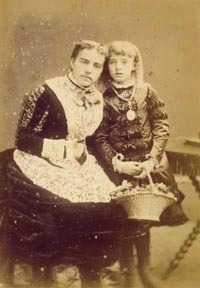 Lilian was her father's favourite daughter, and (it is said) she was somewhat spoiled by him. According to my mother, she was carefree, high-spirited and rather wild as a girl (and a very good horsewoman) and that it was these characteristics that attracted Walter Ernest Newman to fall in love with her at an early age, when he was apprenticed as an articled clerk to his uncle Henry Paynter in Alnwick (following his father's financial difficulties). 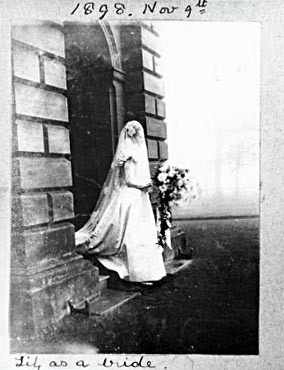 When and why Lilian changed and became the religious and rather reclusive old lady that I remember remains a mystery, but perhaps she began to change early in life since rumour has it that during their many years of courtship, Ernest changed his mind about marrying her and had to be "persuaded" to do so! My mother used to tell me that Lilian modelled her life on the old Queen Victoria, and certainly when I knew her, this was very much the impression that she gave me. Certainly it seemed that my father had little more affection for her than I did; my mother used to tell me that it was because she had been so stern with him when he was a child. It is therefore a little surprising to find that he gives no indication of her sternness in his "Reminiscences", concentrating more on the happy holidays he had with her and his father. Nevertheless, my mother used to tell me that he was not fond of his mother, and how he had to spend long hours during his childhood on his own in his parent's London home because his mother wouldn't allow him to go out. She also told me how his mother forced him to sit for hours while she pulled his teeth into the alignment she wanted - and with some success perhaps, because his teeth were straight enough when I knew him! 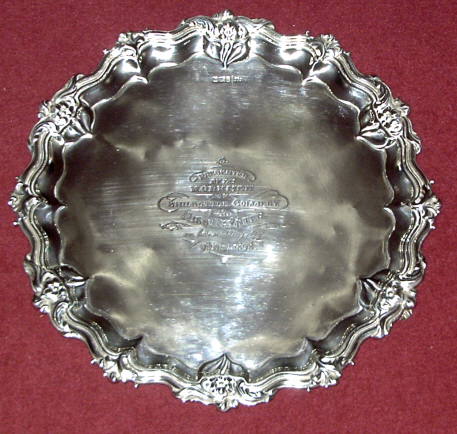 Lilian married Walter on her 25th birthday on 9th November 1898 in Alnwick; the Shillbottle coal miners presented the couple with a fine silver salver (photo bottom of page) which I have loaned to Ray Farnsworth to keep at Freelands (along with a similar present presented to Frederick on his wedding day). The couple must have moved to London soon afterwards since their first child Harold (my father) was born in Kensington in late 1900 where he spent his early years. 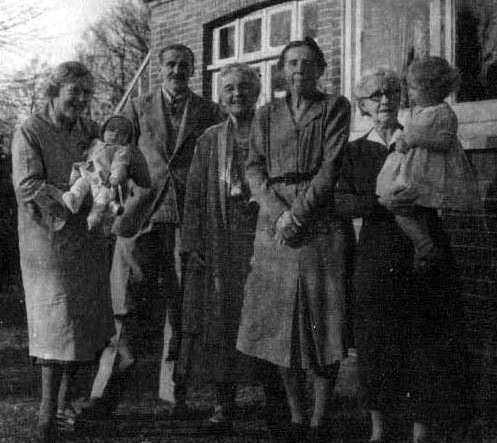 In 1908 Lilian moved with the family to Northwood and in 1912 moved to the Red Cottage also in Northwood where she spent the rest of her life (and where I used to visit her in the 1950s). Lilian had artistic skills, specializing in water colours I believe, though I don't recall ever seeing any of her work. 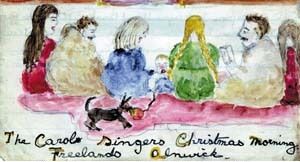 However I suspect that the painting of the Christmas Carol Singers at Freelands (left) may have been an early sketch of hers. She was also interested in the Newman and Paynter family trees, and drew up at least one version which I have a copy of. 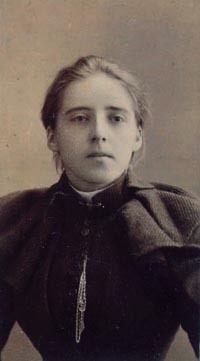 I believe she was involved in voluntary work during the First World War (WVS?) though I have no information about this as yet. Below are two photos taken at the time of my Christening in 1946. See also Aline's page for a photo of Lilian in her forties. 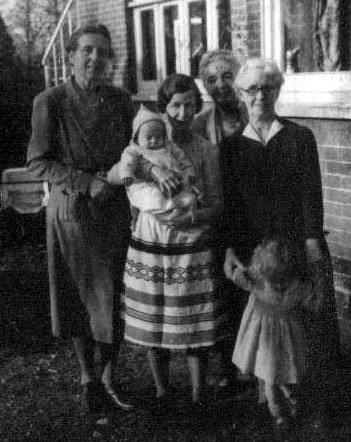 Above (l-r): Lilian Newman, my mother Margaret Newman, my father's aunt Evelyn Newman and my mother's mother Mary Helena Nelson Smith. Above (l-r): Nannie Ingram, my father H.E.M. Newman, his Aunt Evie, his mother Lilian and my mother's mother Mary Helena Nelson Smith.